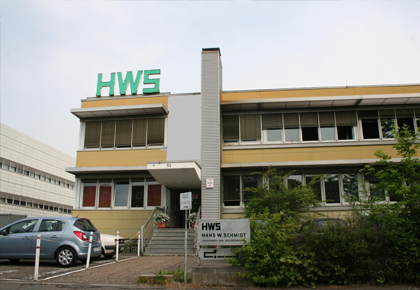 HWS-Labortechnik Mainz was established in 1952. The company emerged from a former business based in Thüringen. is a main objective of the company. This is why great shares in the market could be won during the boom in the post war period. In the year 1960 a new factory building was constructed, which was replaced by bigger plant facilities near the university 10 years later. Now all premises were created, in addition to the core business “laboratory glass” even in sectors like “laboratory electronics” and laboratory mechanics” new impulses could be set. The forcefull extension of the glass apparat production formed the basis that, even the production of difficult equipment could be realized, to make the grade of the increased requirements of our customers. 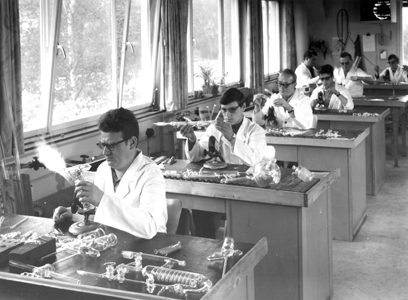 In the start up period the production of glass articles of daily use in big quantities preponderated, later the necessity was faced to include even small series and custom-made products. be used for a scale-up as production conditions are simulated in smaller volumes. These parameters cannot be obtained by experiments with round flasks. By their experience over more than 50 years a materials-crossed concept was established, which provides by a system of compatible components the greatest possible flexibility for the configuration of the required plant. In the field of laboratory electronics new controllers and controlling systems were developed and manufactured in close collaboration with the chemical industry. Although the main focus was set on an independant development of equipment with partly new technologies. In this manner a new melting point- and a pollutant analyzer, a microprocessor controlled temperature regulator and a pneumatic control unit for run out seals were produced. In 1984 the sector “Equipment for Biotechnology” was added in the scope of delivery. Intensive research activities, supported by a joint innovation project resulted in a rounding of the product range biotechnology. The activities of the company are aligned to the requirements of the common chemistry, the pharmaceutical, biochemical and food industry, as well as producers of plastics and lacquer, therefore the clientel consists of researchers as well as employees in all factories and industries of above mentioned fields. 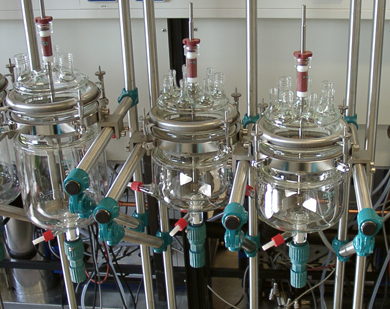 The activity range covers the planning and production of reaction vessels, distillation units, pumps, measurement and control technology, pneumatic components and accessories in borosilicate glass, stainless steel, metal, PTFE and other plastics or special metals. The distribution in Germany takes place exept from several direct contacts, predominately by the laboratory specialised trade. In the European and Non-European countries our products can be received by the laboratory specialised trade or specialized locally companies. In Switzerland, Geat Britain, Belgium, France, Finland, Italy, Turkey, Taiwan, Korea and Israel we have representatives with exclusive trade authorization. Of course you are welcome to contact us in Mainz for questions or problems, we will always try to find an appropriate solution.